Our olfactory journey will lead us this week in a land afar, farther than the isle of Bréhat for this time we shall travel to the very borders of the West : to the gates of Levant. 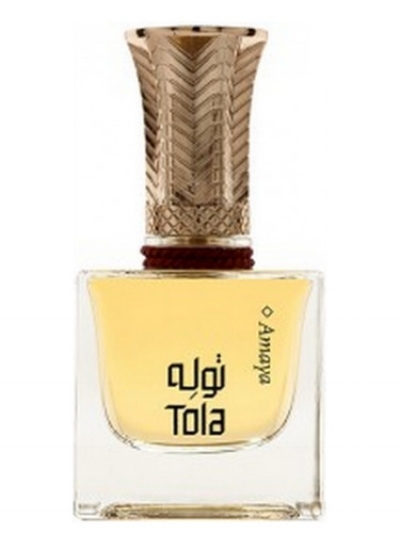 It was our wish, at first, to write a Review of Anbar, by Tola as a way to introduce you to this amazing brand created by Dhaher bin Dhaher, a remarkable man whom we interviewed a week ago. Anbar is indeed the story of our encounter with Dhaher and his work. It is the story of a curious happenstance or rather a happy coincidence which brought us here, today, to tell you about Dhaher’s creations. However, following our Interview, it dawned on us that instead of Anbar, we should write a Review on another of Dhaher’s creation, a very intimate one : Amaya. Amaya is the mother. Not anyone’s mother but every oriental’s mother. Amaya is the earth, the air, the savour, the powder the scent of these mothers – our Levantine mothers. Our Oriental mothers. Our Persian mothers. Tis the scent of their smiles, their sighs, their attentions. Tis the scent of their trading, of their slender hands, from powder whitened and henna darkened. The scent of these hands spinning in the air, shining with gold and rubies and silver, as they ferociously haggle over the price of a carpet, of a necklace or some myrrh. Tis the scent of their silken abayas, of their colourful veils ; of their tailored garments. Tis the scent of theses mothers working the ovens, the gardens ; looking after their ones. Of these humble mothers who keep their heads high, of their iron will to power, to make, to bend and resist. Amaya is the scent of these unsung heroines, of their fables untold ; of their malice and their talents hidden. The scent of their rigour, maternity and motherly love. Amaya is the smell of all these mothers and their humanity. Tis the scent of the princes whom their loins have carried. The scent of the scholars and thinkers ; perfumers and tellers ; aesthetes and poets – whom their loins have carried. Tis the scent of these queen bereft of a throne, these heads bereft of a crown, but that of humility, of patience, of love and poverty. Amaya is the mother, the Orient, the desert. It is a vision of our grandmother which we’ll never forget. We were in Damascus, ere the war. Past midday, I remember sitting by the window overlooking the courtyard. I remember seeing my grandmother, barefoot on the scalding floor, cloaked in a green organza dress, watering the plants. I remember the smell of the hot stone washed with freshwater, the earth, the leaves and the blooming jasmine trees. I remember the smell of the courtyard walls, the smell of their colour ; the smell of the sunlight filtering through the canopy of flowers and hanging leaves. I remember the smell of the sand and dust of Damascus on a winter morn. I remember the smell of coffee in the living room, of the silk and the cushions. My grandmother still proudly wears the scent of the 60’s. She is Amaya, with her monochrome outfits, her off-white vests and pastel blouses. She is Amaya with her jewels in the Damascus fashion, in the old era fashion that she inherited from times before. She is Amaya with her golden rings and emeralds mounted over ruby-red dragons. She is Amaya, with her puckish eye and discreet smile, with her laugh fresh as Lattaquié’s morning dew. She is Amaya with her noble and haughty carriage. With her face slightly powdered and her scent of rouge and spices and sugar and love. She has the stern face of the women whom none can intimidate. These earthen women, who have seen the war ; these women whose lives we cannot even imagine ; these women who left their mark on ancient cities which have fallen. Tis the scent of these heirs who did not indulge in indolence ; of these rich women who did not forget the pain – of poor men. Tis the scent of the mothers pious and humourous. Of the hieratic matriarchs who surprise themselves by singing as they water the roses and jasmine, in the silence of a damascene courtyard – unaware that their grandson might be watching them. We oft underestimate the power of scent. We forget how they can remind us of times past. Therein lies the power of Amaya : its finesse and precision. It stems from the perspicacity of its creator, Dhaher bin Dhaher ; in his sense of tradition and future, in his eye attentive to every detail, every gesture, every perfume belong to his mother and sisters and all the women passing down their rituals from generation onwards. Amaya, its heart of powder and saffron. Amaya, its savour of sugar and jasmine. Amaya, both woody heat and citrus fresh. Amaya, the earth, the sand, the sea. This perfume will through you some childhood memories in the face, for Amaya’s eminently nostalgic. Tis the perfume of the shattered ruins and forgotten memories. Tis, today, the scent of yesterday. Tis the scent of motherly love, a creation like none other. Pure comfort and soothing in a bottle, without compromising its utter class and luxury. One of the most touching perfumes of Dhaher bin Dhaher for touching the mother means touching the mystery. Dhaher grazes it without unveiling it, he offers it to the world with a well found pudour – the ritual of his mother.